Toro Fleet At Man City: Manchester City’s Football Academy in the heart of East Manchester has chosen Toro again as it updates its fleet. The supply of six Reelmaster 3575-D lightweight mowers continues a relationship with Cheshire Turf Machinery and Toro which spans 20 years. 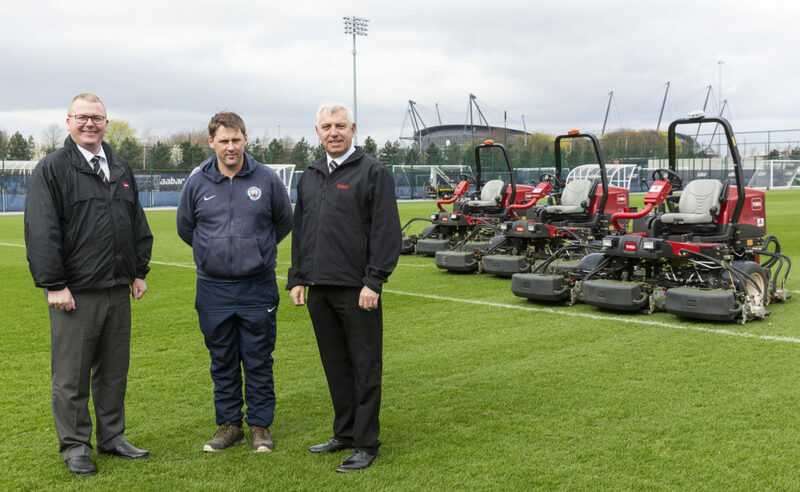 For use across the 80 acres of grounds adjacent to the Etihad Stadium which is used for youth development and first team training, head groundsperson Lee Metcalfe has chosen Toro and the Reelmaster 3575-D mowers to replace its older Toro Reelmaster 5510-D machines. The RM3575-D machines are lightweight – just 2550lbs including the cutting units – and the front-to-back and side-to-side balance of weight produces a low centre of gravity which, when combined with turf-friendly tyres, reduces any potential turf compaction and damage. 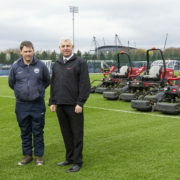 The relationship between Manchester City and Cheshire Turf Machinery is almost two decades long as managing director Steve Halley explains: “We’ve worked with Manchester City Football Club for around 20 years, with Lee and grounds manager Roy Rigby. It’s our understanding that reliability of the brand is key and we trust that our support and the longevity of our relationship is too.